OnePlus is launching it's brand new phone OnePlus 5T, after the huge success of OnePlus 5. While OnePlus didn't confirm it's official launch, OnePlus 5T surfaced online with it's price, specification. Earlier, the device was leaked an Antutu benchmark screenshot as well as a few images of the device's bezel-less screen. The information, however, is still unverified since OnePlus has not dropped a single hint about the existence of the device. As per information on Oppomart, the price tag on OnePlus 5T will start from $549 (around Rs 35,500). The image posted on the website looks similar to renders seen earlier, with a bezel-less display and without a home button. The list of specifications shows that OnePlus 5T will sport a full HD optic AMOLED 6-inch screen. The lack of a home button might mean that OnePlus is planning to shift the fingerprint to the back of the device. The edge-to-edge screen will have a resolution of 1080x2160 pixels and aspect ratio of 18:9. The screen will be protected with Corning Gorilla Glass 5. The listing on Oppomart suggests that OnePlus 5T will carry on with the ongoing dual-camera trend, and have one RGB and one monochrome camera. These two units, one 20-megapixel with f/2.6 aperture and another 16-megapixel with f/1.7 aperture, will comprise the primary camera on the smartphone. The selfie camera on OnePlus 5T will be a 16-megapixel snapper. OnePlus 5T will be running quad-core Qualcomm Snapdragon 835 SoC under the hood, clocked at 2.45GHz and coupled with Adreno 540 GPU. It will run along with either 6GB or 8GB of RAM. The OnePlus 5T will come with two internal memory options - 64GB and 128GB. As for operating system, the smartphone will have Oxygen OS based on Android Nougat, with update to Android Oreo lined up. All of this will be powered by a 3450 mAh battery with dash charge. Oppomart has mentioned that OnePlus 5T will be delivered by the end of November for those who pre-order it now. 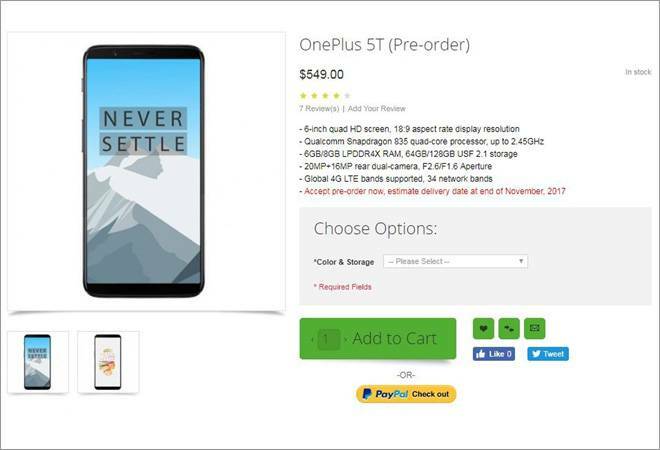 Notably, OnePlus 5 has gone out of stock from several online retail platforms, which might mean that the Chinese smartphone manufacturer is planning to introduce its next offering soon. 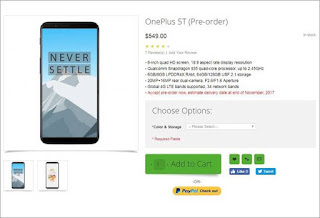 Recently, a screenshot of the OnePlus wwebsite was leaked with what seemed to be the official webpage of OnePlus 5T with blurry images of the device. Although, no definite launch date has declared yet the Chinese smartphone maker.